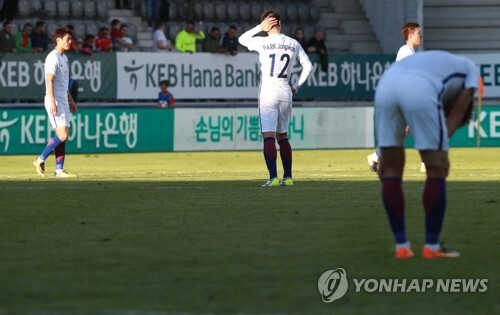 SEOUL, Oct. 16 (Yonhap) — South Korea have dropped out of the top 60 in FIFA rankings following their disappointing losses in recent friendly matches. According to the October rankings unveiled by FIFA on Monday, South Korea fell 11 spots to No. 62 with 588 points, down 71 points from September. The men’s national team, which qualified for the 2018 FIFA World Cup last month, started 2017 as the world’s 37th-ranked team. South Korea, led by head coach Shin Tae-yong, suffered two straight losses in friendly football matches earlier this month. Shin’s side lost 4-2 to Russia in Moscow on Oct. 7 and fell 3-1 to Morocco in Switzerland three days later. The Taeguk Warriors now trail four other Asian Football Confederation (AFC) members: Iran in 34th place, Japan in 43rd, Australia at 44th and China in 57th place. This is the first time that South Korea have had a lower FIFA ranking than China since the world football governing body adopted the ranking system in 1993. South Korea, however, managed to avoid their worst position ever. The men’s national team was ranked 69th in November 2014. With the latest ranking, South Korea are destined to be one of the lowest seeded teams in pot 4 when the 2018 World Cup group draw takes place at the State Kremlin Palace in Moscow on Dec. 1. The 2002 World Cup semifinalists are likely to face a tough draw as they are expected to be in the same group as at least two football powerhouses from Europe and South America. FIFA previously announced that October FIFA rankings would be used to allocate World Cup qualified teams to the four pots according to their ranking in descending order. According to the October rankings, Germany, Brazil, Portugal, Argentina, Belgium, Poland and France will be in pot 1 along with hosts Russia.